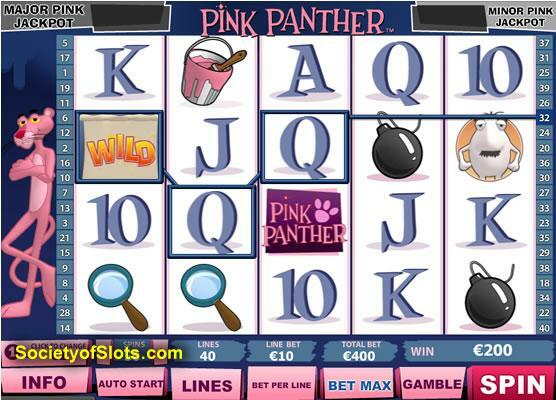 The Pink Panther Slot Machine has 5 reels and 40 pay lines and is packed full of fun features and bonuses. 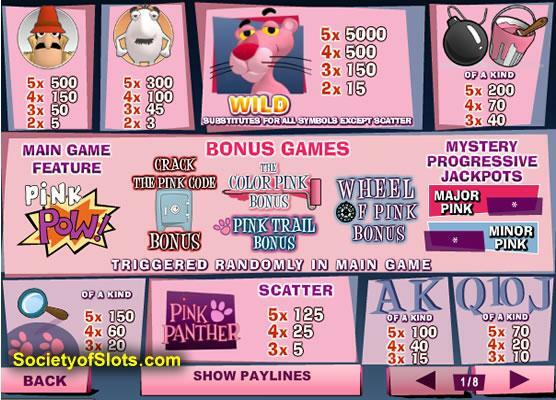 The Pink Panther comes with Wilds, Scatter Bonuses, a "Crack the Pink Code" Bonus Game, a "Pink Pow" Bonus Game, a "Colour Pink" Bonus Game, a "Wheel of Pink" Bonus Game, a "Pink Trail" Bonus Game, plenty of Free Spins. Plus a Gamble feature and if thats not enough. It even has 2x mystery Progressive Jackpots. Bombs & Magnifying Glasses making up the reel symbols, making everything feel very familiar. The Pink Panther himself acts as the wild symbol completing winning combinations. The "Pink Pow" Bonus Round triggers automatically during any game play which can change any symbols from 2-6 randomly to create winning lines making larger payouts. The Pink Panther logo acts as the scatter symbol and has a fixed payout prize. The more scatters you get the more the payout is multiplied. Crack the Pink Code is triggered randomly during normal game play. This bonus entails the opening of safes containing either free spins, free multipliers or an expanding wild feature on reel 3. Which means the whole reel becomes a wild symbol completing many winning combinations. The Colour Pink Bonus is also randomly triggered which sees the Pink Panther and the Little Man paint alternating coloured numbers on a wall. The pink ones are your prizes and will be added to together to form your win. You can also chose to collect the prize or re-paint to win bigger. Up to 3x re-painting rounds can be played. Wheel of Pink Bonus is yet another randomly triggered game which contains 2 wheels. One with various prizes and one with collect/respin on. The wheel is spun and the prizes add up everytime you land respin. If collect comes up, all your previous spin prizes are added together to form your winning amount. The Pink Panther Trail Bonus sees Inspector Clouseau following footsteps for 4 rounds to find the elusive stolen diamond. Where each footstep the inspector takes is a cash prize. After each round you can either collect or continue the trail. But be careful as you may land in a trap and half your winnings will be confiscated and ends the game. If you do continue and manage to the find the diamond though you will get a 2x multiplier on all your collected footstep winnings. Last but not least is the Pink Panther Progressive Jackpot game which is divided in to a Minor Jackpot and a Major Jackpot. Again these progressive games are triggered randomly along with all the Pink panther games which makes this video slot so much fun to play. During the progressive game you will see a collection of 12 doors, The aim is to reveal 5x Pink Panthers to hit the Major Progressive Jackpot. Failing that you will need 4x Inspetor Cluseaus for the Minor Jackpot. But fear not as if you miss both of these prizes you will be rewarded with a consolidation prize based on picking 3 little green men. I will let you find out what that prize is by playing for yourself - enjoy!.